Nike on Tuesday unveiled the Air Native N7 -- its first shoe designed for the Native American foot -- with the stated goal of improving health on U.S. tribal lands. The stated goal of the program: promote physical fitness among a population with higher-than-average rates of obesity and adult-onset diabetes. Profits from the sale of the shoe will be reinvested in health programs for tribal lands, company officials said. Nike researchers and developers spent two years designing the shoe, traveling to seven locations to look at the feet of 224 Native Americans from 70 different tribes. 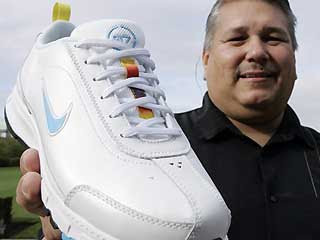 They created a shoe to fit the average Native American foot, which is wider than the foot the Nike Air Pegasus running shoe is designed to fit. About 164 members of the Confederated Tribes of Warm Springs tested prototypes of the shoe before its release, the company said. Jeff Piscotta, senior researcher in Nike's Shoe Research Laboratory, said company researchers have developed a similar custom-fit shoe design for Japanese runners, and as part of the run-up to the 2008 Olympics are researching the feet of Chinese athletes and runners to produce a better-fitting product. Race in Medicine, PLoS Med, cont. "At the same time, alternative attributive markers of genotypic, cultural, and structural determinants of variation in health and access to health care need to be developed in order to: (1) improve the aetiological precision of biomedical research; and (2) facilitate the translation of research on the causes of variation in health across racial and ethnic groups into appropriate care for individual patients. This more precise approach would help to address a long-standing problem with evidence-based practice, which often struggles to apply the results of epidemiological research on populations to the clinical care of individuals . ... our proposal for the use of different racial and ethnic categories as descriptive variables in different scientific, clinical, and social contexts, and for more precise genotypic, cultural, and structural variables to attribute the causes of racial and ethnic inequalities in health and health care, faces a number of difficult challenges. These include a lack of consensus on whether, and how, race and ethnicity should be operationalised in different scientific, clinical, and social contexts [3,4,14,17], and the need to develop standard instruments for capturing genotypic, cultural, and structural characteristics amenable for use across these contexts. It is also unclear who might be best placed to promote such consensus or develop such instruments. Two papers in the new issue of PLoS Medicine review where we are at on this topic. I'll go over this one first, and the other one later. Racial Categories in Medical Practice: How Useful Are They? As genetic findings assume an increasingly prominent place in biomedical research, some have concluded that self-identified race/ethnicity, routinely collected in biomedical research studies, is a reasonable proxy for genetic homogeneity and may lead to important insights into health disparities [36,41–43]. Others, citing the genetic heterogeneity within self-identified groups [44–46], argue that race should not be used in genetic research [47–50]. A related perspective comes from those who argue that self-identified racial/ethnic categories may be practical for recruitment into studies, but should not be used in genetic analyses, given that more biologically precise measures of human genetic heterogeneity are available [17,51]. A recent study of geographic patterns of genetic variation, for example, found that “commonly used ethnic labels are both insufficient and inaccurate representations of the inferred genetic clusters, and that drug-metabolizing profiles…;differ significantly among the clusters” . Then they proceed to give some interesting historical context to the social context of race identification and self-identification. Race-related differences in health outcomes can be analyzed at the societal, individual, cellular, and subcellular levels. Studies focusing exclusively on one level often lose track of inter-level connections. Two research groups exemplify efforts to integrate research on health disparities at the level of cellular effects (e.g., on tumor production and growth), of societal level events (e.g., social support or toxin exposure), and individual life history events (e.g., reproductive history, stress, diet). Epidemiologist Nancy Krieger [80–82] applies the concept of embodiment to an understanding of how the social effects of racism and social inequality become symptoms  and illnesses that manifest as racially related health disparities (on embodiment, see also Fausto-Sterling, 2005 ). Krieger understands embodiment to be a multilevel phenomenon that serves as “an antonym to disembodied genes, minds and behaviors” . Similarly, Masi and Olopade  propose a multilevel perspective on racial and ethnic disparities in breast cancer. Their model illustrates how the dynamics of societal and individual events over the life cycle can have specific cellular outcomes resulting in neoplasms with particular cellular characteristics. To the extent that societal and individual events vary systematically with social race, biological outcomes may result from social inequalities. The key to future understandings of health disparities lies in using frameworks such as those proposed by Krieger and Masi and Olopade to design and interpret research at every level, from the social to the cellular. and then onto some other diagnostic considerations beyond "race"
Improved medical training about race can sharpen diagnostic skills. Cultural competency instruction should be modified to include information on the history of racial categories, current controversies about their biological significance, and the limits of their utility. A teaching unit on race would also contrast the differences between race as a population concept with its meaning when applied to the lives of individuals. In this context it would be appropriate to teach about geographical variations in specific allele frequencies for genes linked to particular disease processes, as well as the cultural practices, historical trends, and environmental conditions that favor their prevalence or not. ... But we argue that even if there are short cuts for the medical interview, race is not a good one. There is, in the end (in addition to noting physical symptoms), no substitute for an inquiry into family history, an assessment of current circumstances, and knowledge about the biological and cultural histories of specific populations serviced by a particular treatment center. ...the National Institutes of Health needs to re-examine its race-based research rules, weighing the balance between attempting to include minority populations in our health care system, on the one hand, without forcing us into a misconstrual of race as biology on the other. To provide the best health care we must be able to say why and when race matters and why and when it doesn't. There isn't anything ground breaking in this paper, but it does provide a good review of the topic and has some useful suggestions for measures that could be put into place, most notably the importance of better training so that doctors are able to place patients in a social, cultural and biological context, all at the same time, in helping to make their diagnosis. So basically, researchers need to come up with this knowledge (i.e. the interaction of race and society and biology) and then it needs to be disseminated to the medical community. I found the examples in Box 2 really interesting. I had blogged previously about one of the mentioned researchers: Olopade. I'll have to look more closely at what exactly these people are doing. I use Yahoo as my homepage, and this title was one of the five or so major headlines for the morning. I, of course, sarcastically added the "Breaking News" part. Apparently there's a new paper in PNAS by Cosmides of Cosmides and Tooby Ev. Psych fame. Having only read the news story, I'm sorry to say that despite the alarming headline (haha), the study itself does not appear to be groundbreaking stuff in the least...basically analogous to the already well worn story of humans being more afraid of snakes than guns. I just found the headline and the fact that it was a major headline very funny, so had to share it...ok, ok, enough with the silly distractions, and back to work. High prevalence of vitamin D deficiency in newborn infants of high-risk mothers. Dijkstra SH, van Beek A, Janssen JW, de Vleeschouwer LH, Huysman WA, van den Akker EL. OBJECTIVE: To determine the prevalence of vitamin D deficiency in newborn infants of mothers at risk of vitamin D deficiency because of dark skin or the wearing of concealing clothes (such as a veil) compared with a group presumed not to be at risk. A second aim was to correlate these newborn infants' vitamin D concentrations with biochemical parameters of vitamin D metabolism and bone turnover at birth. DESIGN: A prospective study conducted between April 2004 and February 2006 including women delivering during this period and their newborn infants. SETTING: The outpatient clinic of the obstetrics department, Sint Franciscus Gasthuis, Rotterdam, the Netherlands. PATIENTS: Eighty seven newborn infants of healthy mothers with either dark skin and/or concealing clothing (risk group) or light skin (control group). RESULTS: We found a significant difference in the prevalence of vitamin D deficiency (25-hydroxyvitamin D(3) less than 25 nmol/l) between newborn infants of mothers at risk and those of mothers in the control group (63.3% vs 15.8%; p less than 0.001). Mean alkaline phosphatase concentrations were significantly higher in the at risk group. CONCLUSIONS: Newborn infants of mothers with dark skin or wearing concealing clothes are at great risk of vitamin D deficiency at birth. The clinical implications are unknown. Further research is necessary to determine the long-term consequences of maternal and neonatal vitamin D deficiency so that guidelines on vitamin D supplementation during pregnancy can be issued. Flores hobbit is not a modern human? A paper describing the wrist bone of the Flores individual supposedly shows more similarities with African apes and early hominins than with modern humans. This is going to come out in Science soon, so I'm just going on this Yahoo! News story. Abstract: The city of Bahía Blanca occupies a strategic place in Argentina south of the Pampean region in the north-east corner of the Patagonia. Since 1828, this city has been the historical and political border between Amerindian lands in the south, and the lands of European colonists. Nowadays, Bahía Blanca is an urban population mainly composed by descendents of immigrants from Spain and other European countries with apparently low admixture with Amerindians. In view of the unexpectedly high Amerindian admixture levels (about 46.7%) suggested by mtDNA data, and protein markers (19.5%), we analyzed a set of 19 Alu polymorphisms (18 autosomal, 1 of Chromosome Y) in a well-documented genealogical sample from Bahía Blanca. The genotyped sample was made up of 119 unrelated healthy individuals whose birth place and grandparent origins were fully documented. According to available genealogical records, the total sample has been subdivided into two groups: Bahía Blanca Original (64 individuals with all 4 gandparents born in Argentina) and Bahía Blanca Mix (55 individuals with one to three grandparents born out of Argentina). Allele frequencies and gene diversity values in Bahía Blanca fit well into the European ranges. Population relationships have been tested for 8 Alu markers, whose variation has been described in several Amerindian and European samples. Reynolds genetic distances underline the significant genetic similarity of Bahía Blanca to Europeans (mean distance 0.044) and their differentiation from Amerindians (0.146). Interestingly enough, when the general sample is divided, Bahía Blanca Original appears slightly closer to Amerindians (0.127) in contrast to Bahía Blanca Mix (0.161). Furthermore, the genetic relationships depicted through a principal components analysis emphasize the relative similarity of Bahía Blanca Original to Amerindians. A thorough knowledge of the sample origins has allowed us to make a subtle distinction of the genetic composition of Bahía Blanca. The last post on endurance running/persistence hunting as an important human adaptation generated a lot of interest, so I thought I'd give an update. The new issue of Journal of Human Evolution has some commentaries between the authors of that paper and some critics of the idea. In a nutshell, the critics cite paleo-environment evidence that Homo was in a denser savannah woodland enivronment two million years ago, that would not have been suitable for running long distances due to excessive vegetation and compact ground (as opposed to sand that would tire prey out). They also discuss the lack of any evidence for ER among Hadza and other groups, and the plausibility of sophisticated tracking abilities needed for ER hunting that far back (2mya). I'd have to say that I am pretty skeptical myself of the ER running hypothesis as a significant human adaptation. However I am not familiar enough with the physiological and anatomical evidence that supporters of this idea present. I meant to get into this PLoS One paper, but never got around to it. Here's a quick and dirty Yahoo! News story on it. Canada—Men showed fertility until 55 years old. I think this complements the grandmother hypothesis as an explanation for long lifespans in humans. The take home message is that productivity in later age humans is highly valued due to a big productivity deficit in early life due to the importance of acquiring embodied capital due to our evolved feeding and social niche. (that was not well written, but hopefully kinda clear) - basically humans are altricial and require a lot of investment due to our ecological niche, therefore increasing payoffs to longevity and long-term productivity.... so that's why females prefer older guys who can provide such important child-rearing resources, since they have built up a lot of embodied capital, and also why older aged females can be vital (as grandparents). I'm not too sure what to think of this paper. It's a really interesting topic, namely, the relative merits of maintaining cultural identity vs. cultural integration. I'm not a big fan of this kind of modeling, but the application of their model to geopolitical situations in the former Yugoslavia and India are interesting, although the Yugoslavia one is not very convincing. The figure shows A converted into their model B and then "Our prediction of populations likely to be in conflict with neighboring groups [red overlay, (C) and (D)] agrees well with the location of cities reported as sites of major fights and massacres [yellow dots, (D)]"
"It is worth considering whether, in places where cultural differentiation is taking place, conflict might be prevented or minimized by political acts that create appropriate boundaries suited to the current geocultural regions rather than the existing historically based state boundaries. Such boundaries need not inhibit trade and commerce and need not mark the boundaries of states, but should allow each cultural group to adopt independent behaviors in separate domains. Peaceful coexistence need not require complete integration." Abstract: We identify a process of global pattern formation that causes regions to differentiate by culture. Violence arises at boundaries between regions that are not sufficiently well defined. We model cultural differentiation as a separation of groups whose members prefer similar neighbors, with a characteristic group size at which violence occurs. Application of this model to the area of the former Yugoslavia and to India accurately predicts the locations of reported conflict. This model also points to imposed mixing or boundary clarification as mechanisms for promoting peace. The Genetic Genealogist has a post describing a new partnership between Illumina and a company called 23 and me. Basically any individual can send in their buccal cells and have their DNA typed for up to a million SNPs for about $600. It looks as if Google may be getting in on this via one of the founder's wife who is the head of the company. There are many links to stories about this company at the Genetic Genealogist, including this one at Forbes.com. "Initially, Flatley said, the company will be more focused on ancestry--questions like which parent one got more traits from, or who your distant relatives are--than medicine. Many researchers say most genetic discoveries are so far only of limited medical utility." You can also check out the recent webcast detailing all this. Razib has the abstract of a new paper in Nature Genetics about a study examining phenotypic effects in mice and signatures of selection around ACTN-3 in humans. One variant shows major differences between sub-Saharan Africans and others, and it has a pretty well documented role in muscle fiber composition (fast twitch vs. slow twitch) and the ability to be good at sprinting vs. endurance activity. see here, here, and here for related posts. In this review (see abstract below), Dunbar and Shultz reviews some of the explanations for large brain size and discuss in greater detail the social brain hypothesis (SBH), suggesting that "balance of evidence now clearly favors the suggestion that it was the computational demands of living in large, complex societies that selected for large brains". They discuss some of the recent findings on the relationships between monogamy/enduring social bonds and large brain size. Science 7 September 2007: 1344-1347. Abstract: The evolution of unusually large brains in some groups of animals, notably primates, has long been a puzzle. Although early explanations tended to emphasize the brain's role in sensory or technical competence (foraging skills, innovations, and way-finding), the balance of evidence now clearly favors the suggestion that it was the computational demands of living in large, complex societies that selected for large brains. However, recent analyses suggest that it may have been the particular demands of the more intense forms of pairbonding that was the critical factor that triggered this evolutionary development. This may explain why primate sociality seems to be so different from that found in most other birds and mammals: Primate sociality is based on bonded relationships of a kind that are found only in pairbonds in other taxa. Nature Genetics has a paper out on the differences in copy number of a gene (AMY1) that is involved in starch digestion between humans and other primates. The authors extend the implications of their findings a bit too far however (or at least they do in the BBC writeup) in saying that starch was more responsible than meat in allowing for a large brain. The part on between-population differences in humans is pretty cool. Check out some previous posts with a similar theme: USOs in hominin diet (USOs- underground storage organs, such as potatoes etc...) and the role of cooking in human evolution. Abstract: Starch consumption is a prominent characteristic of agricultural societies and hunter-gatherers in arid environments. In contrast, rainforest and circum-arctic hunter-gatherers and some pastoralists consume much less starch1, 2, 3. This behavioral variation raises the possibility that different selective pressures have acted on amylase, the enzyme responsible for starch hydrolysis4. We found that copy number of the salivary amylase gene (AMY1) is correlated positively with salivary amylase protein level and that individuals from populations with high-starch diets have, on average, more AMY1 copies than those with traditionally low-starch diets. Comparisons with other loci in a subset of these populations suggest that the extent of AMY1 copy number differentiation is highly unusual. This example of positive selection on a copy number–variable gene is, to our knowledge, one of the first discovered in the human genome. Higher AMY1 copy numbers and protein levels probably improve the digestion of starchy foods and may buffer against the fitness-reducing effects of intestinal disease. Are highly conserved sequences what we think they are? Mutations in genes near each of the other ultraconserved elements revealed a range of similarly lethal or severe abnormalities, ranging from neurological and sexual disorders to defective eye and kidney development. But in no case did the researchers find comparable aberrations in mice lacking the adjacent ultraconserved elements. These results challenge the prevailing notion that highly conserved elements necessarily encode essential functions. Still, the researchers acknowledge that their experimental setup could have missed phenotypic changes that may have emerged under other conditions (in the wild, for example, or over multiple generations). Since all the ultraconserved elements were chosen based on their ability to promote transcription in lab tests—ensuring that the elements were capable of function—it's possible that deleting them produced no obvious effects because other elements stepped in to perform their job. Future studies can explore these possibilities and continue to probe the mechanisms that gave rise to such extreme evolutionary conservation. But for researchers relying on sequence constraint to shed light on the function of billions of noncoding base pairs in the human genome, the question remains: Why would evolution preserve these noncoding elements if their loss has no significant effect on the viability, fertility, and function of the organism? Abstract: Ultraconserved elements have been suggested to retain extended perfect sequence identity between the human, mouse, and rat genomes due to essential functional properties. To investigate the necessities of these elements in vivo, we removed four noncoding ultraconserved elements (ranging in length from 222 to 731 base pairs) from the mouse genome. To maximize the likelihood of observing a phenotype, we chose to delete elements that function as enhancers in a mouse transgenic assay and that are near genes that exhibit marked phenotypes both when completely inactivated in the mouse and when their expression is altered due to other genomic modifications. Remarkably, all four resulting lines of mice lacking these ultraconserved elements were viable and fertile, and failed to reveal any critical abnormalities when assayed for a variety of phenotypes including growth, longevity, pathology, and metabolism. In addition, more targeted screens, informed by the abnormalities observed in mice in which genes in proximity to the investigated elements had been altered, also failed to reveal notable abnormalities. These results, while not inclusive of all the possible phenotypic impact of the deleted sequences, indicate that extreme sequence constraint does not necessarily reflect crucial functions required for viability. The implications are somewhat ambiguous, but it suggests that we should avoid any hasty conclusions from ancient DNA sequence. via Anthropology.net, a new paper coming out in PNAS finds evidence of important climatic events that may, somehow(?? ), bear on important events in human evolution circa 100,000-50,000 years ago. Abstract: The environmental backdrop to the evolution and spread of early Homo sapiens in East Africa is known mainly from isolated outcrops and distant marine sediment cores. Here we present results from new scientific drill cores from Lake Malawi, the first long and continuous, high-fidelity records of tropical climate change from the continent itself. Our record shows periods of severe aridity between 135 and 75 thousand years (kyr) ago, when the lake's water volume was reduced by at least 95%. Surprisingly, these intervals of pronounced tropical African aridity in the early late-Pleistocene were much more severe than the Last Glacial Maximum (LGM), the period previously recognized as one of the most arid of the Quaternary. From these cores and from records from Lakes Tanganyika (East Africa) and Bosumtwi (West Africa), we document a major rise in water levels and a shift to more humid conditions over much of tropical Africa after 70 kyr ago. This transition to wetter, more stable conditions coincides with diminished orbital eccentricity, and a reduction in precession-dominated climatic extremes. The observed climate mode switch to decreased environmental variability is consistent with terrestrial and marine records from in and around tropical Africa, but our records provide evidence for dramatically wetter conditions after 70 kyr ago. Such climate change may have stimulated the expansion and migrations of early modern human populations. "Is there variation in MC1R biochemical function among primates, and, if so, does this variation relate to primate phylogeny and/or coat color? Is the mechanism of red hair generation the same in orangutans and humans? Is there evidence for evolution of the relative importance of different control mechanisms on MC1R activity? Pharmacological characterization involved 2 types of assay: melanocortin ([Nle4, D-Phe7]-MSH and -MSH) -binding assays and second messenger (cAMP) assays in response to agonist (-MSH) and inhibitor/inverse agonist (ASIP)." Abstract: We have characterized the biochemical function of the melanocortin 1 receptor (MC1R), a critical regulator of melanin synthesis, from 9 phylogenetically diverse primate species with varying coat colors. There is substantial diversity in melanocyte-stimulating hormone (MSH) binding affinity and basal levels of activity in the cloned MC1Rs. MSH binding was lost independently in lemur and New World monkey lineages, whereas high basal levels of MC1R activity occur in lemurs and some New World monkeys and Old World monkeys. Highest levels of basal activity were found in the MC1R of ruffed lemurs, which have the E94K mutation that leads to constitutive activation in other species. In 3 species (2 lemurs and the howler monkey), we report the novel finding that binding and inhibition of MC1R by agouti signaling protein (ASIP) can occur when MSH binding has been lost, thus enabling continuing regulation of the melanin type via ASIP expression. Together, these findings can explain the previous paradox of a predominantly pheomelanic coat in the red ruffed lemur (Varecia rubra). The presence of a functional, MSH-responsive MC1R in orangutan demonstrates that the mechanism of red hair generation in this ape is different from the prevalent mechanism in European human populations. Overall, we have found unexpected diversity in MC1R function among primates and show that the evolution of the regulatory control of MC1R activity occurs by independent variation of 3 distinct mechanisms: basal MC1R activity, MSH binding and activation, and ASIP binding and inhibition. This diversity of function is broadly associated with primate phylogeny and does not have a simple relation to coat color phenotype within primate clades. Check out Dienekes' post on a preprint AJHG paper. The authors discuss the acertainment bias in the markers chosen for HapMap and Perlegen. They resequenced "the exons and flanking regions of 3,873 genes in 154 chromosomes from European, Latino/Hispanic, Asian, and African Americans generated by the Genaissance Resequencing Project." The major finding is that so-called common alleles differ in their "commonness" between groups - not very surprising. I guess the main take-home messages are the ascertainment bias in the HapMap SNPs and the consequent usefulness of their method, and a reaffirmation of the importance of "geographic ancestry", as they call it, when looking at the genetic basis for disease risk. ABSTRACT: The common variant/common disease model predicts that most risk alleles underlying complex health-related traits are common and therefore old and found in multiple populations, rather than rare or population-specific. Accordingly, there is widespread interest in assessing the population structure of common alleles. However, such assessments have been confounded by analysis of datasets with bias toward ascertainment of common alleles (e.g., HapMap, Perlegen) or in which a relatively small number of genes and/or populations were sampled. The aim of this study was to examine the structure of common variation ascertained in major U.S. populations by resequencing the exons and flanking regions of 3,873 genes in 154 chromosomes from European, Latino/Hispanic, Asian, and African Americans generated by the Genaissance Resequencing Project. The frequency distributions of private and common single nucleotide polymorphisms (SNPs) were measured, and the extent to which common SNPs were shared across populations was analyzed using several different estimators of population structure. Most SNPs that were common in one population were present in multiple populations, but SNPs common in one population were frequently not common in other populations. Moreover, SNPs that were common in two or more populations often differed significantly in frequency from one another, particularly in comparisons of African Americans versus other U.S. populations. These findings indicate that even if the bulk of alleles underlying complex health-related traits are common SNPs, geographic ancestry might well be an important predictor of whether a person carries a risk allele. Behavioral variation and reproductive success of male baboons (Papio anubis x Papio hamadryas) in a hybrid social group. Bergman TJ, Phillips-Conroy JE, Jolly CJ. Abstract: We take advantage of an array of hybrid baboons (Papio anubis x Papio hamadryas) living in the same social group to explore the causes and consequences of different male mating strategies. Male hamadryas hold one-male units and exhibit a sustained, intense interest in adult females, regardless of the latter's reproductive state. Anubis baboons, by contrast, live in multi-male, multi-female groups where males compete for females only when the latter are estrous. These two taxa interbreed to form a hybrid zone in the Awash National Park, Ethiopia, where previous work has suggested that hybrid males have intermediate and ineffective behavior. Here, we first examine male mating strategies with respect to morphological and genetic measures of ancestry. We found significant relationships between behavioral measures and morphology; males with more hamadryas-like morphology had more hamadryas-like behavior. However, genetic ancestry was not related to behavior, and in both cases intermediates displayed a previously unreported level of behavioral variation. Furthermore, male behavior was unrelated to natal group. Second, we evaluated reproductive success by microsatellite-based paternity testing. The highest reproductive success was found for individuals exhibiting intermediate behaviors. Moreover, over nine years, some genetically and morphologically intermediate males had high reproductive success. We conclude that the behavior of hybrid males is therefore unlikely to be an absolute barrier to admixture in the region.